E-book reading becomes more and more spread over the whole world and need for the relevant devices increases every day. Consequently new choices for such devices appear on the markets for book lovers and for those who's got reading as one of his essential activities. But many of us still hesitate about making the right choice being more profitable. For this purpose we offer you a comparison of Kindle and Nook as well as their features for every reader to find his advantages in these devices. 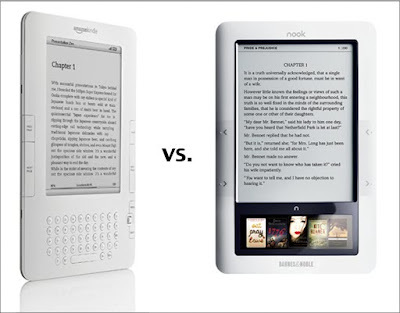 From the point of dimensions Nook seems to be more compact but at the same time it's a bit heavier than Kindle. Nook has got color touchscreen, left/right paging buttons. But on the other hand Kindle has got Text-to Speech feature which will read books aloud for you with male and female voices according to your option. As for the content format Kindle supports TXT, PDF, Audible (Audible Enhanced (AA, AAX)), MP3, unprotected MOBI, PRC natively; HTML, DOC, JPEG, GIF, PNG, BMP through conversion. And Nook is compatible for EPUB, PDB, PDF, JPG, GIF, PNG, BMP, MP3 files. Nook's got AT&T 3G; 802.11b/g WI-Fi connectivities but it does not have it's browser as the Kindle does have + a wireless modem. With Nook you can also read your e-books on: iPhone, iPod touch, BlackBerry, PC, Mac OS. With Kindle you can do it on iPhone and iPod touch. These are the main features that these two devices contain. Now it's up to you about making the choice. Feel free to add your comments, opinions and advices about these two gadgets helping others in their decision.